Can you imagine going on a mission and not knowing when you would return to your family? How would you feel? What would you do to prepare? The four sons of King Mosiah﻿—Ammon, Aaron, Omner, and Himni﻿—and their friend Alma went on a mission that lasted 14 years. Each of the sons of Mosiah could have been the king of their own country, but instead they followed their hearts. They and Alma had become converted to the gospel of Jesus Christ, and they wanted to share the gospel with the Lamanites, their enemies. Fasting and praying helped these young men receive blessings from God. Just like Alma and the sons of Mosiah, you can fast and pray to prepare to receive the blessings Heavenly Father has for you. As a family, discuss the importance of praying before and after a fast. The next time your family fasts, talk about a purpose for it. Begin your fast by praying and talking with Heavenly Father about why you are fasting. Place a colorful rock on your bed as a reminder to pray and share with Heavenly Father what you are fasting about. After you pray to begin your fast, place the rock on the floor next to your bed. When your fast is over, the rock will be a reminder to kneel down and pray. You can use this rock as a reminder on fast Sunday every month and when you have special fasts with your family, ward, or branch. 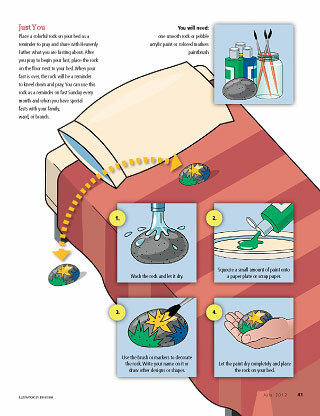 Wash the rock and let it dry. Squeeze a small amount of paint onto a paper plate or scrap paper. Use the brush or markers to decorate the rock. Write your name on it or draw other designs or shapes. Let the paint dry completely and place the rock on your bed.